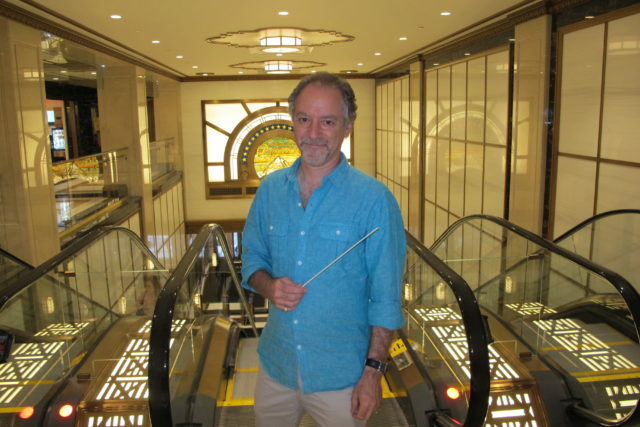 Music director, conductor, and keyboardist Lawrence Goldberg of NYC Local 802 has worked on dozens of Broadway and Off-Broadway shows, as well as national tours. Since wrapping up work as music director for A Gentleman’s Guide to Love and Murder in 2017, he’s been subbing for Phantom of the Opera and the Cats revival on Broadway. Over the summer, he conducted Anastasia on Broadway once a week in preparation for his role as music director for the touring show. We sat down with Goldberg shortly before that tour began last month. What attracted you to focus on musical theatre? In college I studied classical piano and composition, but my ambition back then was to be Billy Joel. I didn’t have a real cohesive plan, so I was getting a musical education. Then, I realized that I didn’t have a rock and roll persona. I had become very close friends with [now Boston Pops conductor] Keith Lockhart at Carnegie Mellon University. He started music directing shows that the drama department was doing over the summer and he hired me to be his assistant. I realized that theater was a great place to pursue many different styles of music and where I could approach a steady living. What are some of the favorite shows you’ve worked? Why? I break them down into two broad categories: comedies and dramas. I love working on comedies because they are so fun. But comedies tend to require that the music stays out of the way and lets the comedy be the focal point. I had a ball doing shows like The Producers and The Drowsy Chaperone, but musically they weren’t quite so satisfying. On dramas I feel like I have a more integral role in shaping the audience’s emotional response and that’s fulfilling. Shows like Les Misérables and South Pacific, where I feel like I’m almost another actor in the drama, give me a lot of enjoyment. What can you tell me about the show Anastasia? What made you want to music direct it? Anastasia began as the animated musical that [Stephen] Flaherty and [Lynn] Ahrens wrote the score to in 1997. It capitalized on the resurgence of new Disney animated musicals, though Anastasia was not Disney. When they decided to do the Broadway version, they used six of the songs from the movie and adapted them, but also drew upon the live action movie from 1956, which starred Ingrid Bergman. They got rid of the fantastical nature of the animation and made it more realistic. Flaherty has always been one of my musical heroes. I admire his writing and it was a thrill to get to know him personally in the process. He writes smart but accessible material and Anastasia is certainly a good example. Anastasia is a strongly put together show. The orchestrations were brilliantly done by Doug Besterman. What is your favorite piece in the show? In the second act of the show the characters attend a performance of Swan Lake at the ballet in Paris. The writers created this wonderful ballet piece that uses two of the famous themes from Swan Lake and intertwines them with four melodies of songs heard earlier in the evening. Four different characters each sing a theme. It all gets intertwined with the themes of Swan Lake, and meanwhile, there’s this gorgeous classical ballet going on. It’s such a virtuosic piece and brilliantly put together. The highlight of the evening for me is conducting that ballet. How big is the touring pit? We have 12 pieces on the road. Two keyboard players plus myself are touring. I’m the standup conductor. We pick up 10 local musicians in every city. Associate conductor/keyboard 2 is Valerie Gebert [of Locals 369 and 444]. She just came off Finding Neverland. To have somebody I know I can trust, both conducting the show and rehearsing, is a wonderful feeling. The keyboard 1 player traveling is Josh Cullen [of Local 802]. He’s a bit younger, but he’s a fantastic pianist. What role do AFM locals and contractors play at each stop? I really rely on local contractors. They live in the community and know the players. The onus is on them to give me the best players for each show. It’s a touchy situation in some ways, depending on the local market. If there’s not a lot of theatre going on, local musicians have a hard time making a living and rely on playing the tours. They want some expectation that they will be hired repeatedly; but from my perspective, the style of the show should determine who gets hired. In the larger cities it’s not usually an issue, but in smaller cities I have to understand that these people are relying on this work and we have to work with whoever gets hired. How difficult is it to bring the music up to par with just one rehearsal? That depends on if you’re in a big city with experienced musicians or in a smaller place. I show up on Tuesday morning at 9:00 a.m. with a new group of musicians and I’ve got five hours. We’re going to do a show in front of people that night. The biggest challenge of my job is deciding what the best use of that time is to get the best result. And sometimes it’s very easy and clear from the get go that everything’s gonna be fine—they’ve done their homework and they have the right instincts—and sometimes it’s less so. In those times, I have to work at keeping it a positive experience. I know that they’re all doing their best. I have to try to do what’s best for the show and be as understanding as possible. Sometimes that means asking people to lay out on a part and having a keyboard cover it. Do you send advance books to each market? Yes, we send the music ahead three or four weeks. We also typically shoot a video of me conducting the show and make it available online. The Internet has become such a huge tool for tours. Is it always five hours of rehearsal time? It varies, depending on the production and the needs of the music. When I did The Producers tour, we had seven hours, split between Monday evening and Tuesday morning. That costs a lot more money. The Producers was such a huge hit and it was so controlled. Susan Stroman and Mel Brooks kept such hands-on control of the quality that they had the full orchestration on the road—23 pieces. They didn’t want to compromise. Five hours is on the generous side these days. If there’s two hours of music, three hours of rehearsal is barely enough time to play everything. Usually the sweet spot is between four and five hours. Have there been any shows that were particularly difficult to conduct? I think the two most difficult shows that I music directed were The Producers and Les Misérables, for different reasons. Les Misérables is difficult because the music never stops and it’s so constantly intense. I remember in the first act I had a 14-second break where I would try to drink a whole bottle of water, otherwise I was too busy to even pick it up. That was hard physically. With The Producers, everything was either a punchline or a setup to a punch line. Mel Brooks is a comic scientist and the timing of how the music would land after each punch line was so crucial to him. Literally every 10 seconds there was a vamp. That was a stressful show to conduct because I constantly had to get the music to slam in right after each joke. Do you have a preference for working on Broadway or touring shows? What are the negatives or positives of each? Obviously, Broadway is the pinnacle of the musical theatre business. I’ve been lucky to split my time evenly between working on Broadway and working on the road. On Broadway, I’m at home, I can see my friends, and I can do other things in the business. When I go on the road, all that kind of goes out the window and it becomes a challenge living my life day to day. I have to think about where I’m going to find food, where I’m going to do laundry, and my social life is limited to the people I’m working with. The thing I like about being on the road is that it sort of forces me to boil down life to the essentials. I think it’s healthy to force myself to live out of a suitcase every now and then and decide what things are important and what things I can do without. Traveling with a small group of people in such an intense environment, I tend to make closer and more lasting friendships than in my normal life. On the road, because I’m picking up local musicians, it’s a constant challenge and it stays interesting. On Broadway, you can get a little complacent. Do you recall when you first joined the AFM? Have you ever conducted in the nonunion space? My first local was 60-471 in Pittsburgh. I transferred to Local 802 in 1990. No, I’ve never conducted non-union. After the South Pacific tour closed they asked me to be involved with auditions for a non-union tour. I had such mixed feelings that I’m contributing to the dilution of our labor market. When we work for non-union employers and productions, it threatens the high standards we have all worked so hard to achieve and maintain. I know that there are music directors that get involved with the rehearsing of those tours; luckily I haven’t had to face that.